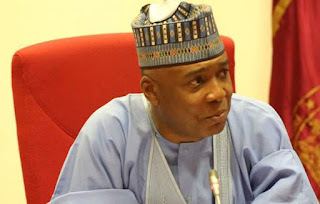 National leader of the Peoples Democratic Party (PDP) and the Senate President, Dr. Bukola Saraki, has criticised President Muhammadu Buhari for directing security agents to deal ruthlessly with ballot box snatchers during the general elections. Speaking at a PDP youth rally in Ilorin on Thursday, where about 10,000 decampees were received by the leaders of the party, Saraki said that a president who love his people would not have ordered soldiers to kill them. He expressed confidence that Alhaji Atiku Abubakar will emerge as the new Nigeria’s president on Saturday, pointing out that Nigerians support for the PDP’s presidential candidate across the length and breadth of the country is overwhelming. Saraki, who said that government of Atiku Abubakar had promised 40 per cent appointment for youths when elected, added that votes for PDP would ensure growth and development of Nigeria and Kwara state. He enjoined the youth to vote for PDP candidates in the coming elections, saying that their votes would ensure sustenance of integrity of Kwara state and its people. The decampees included members of the Mega Party of Nigeria, APC, ACPN, Action Alliance (AA) and Labour Party. Saraki, had earlier led the campaign train of the PDP to Malete, Shao in Kwara north and Oke-Oyi in Ilorin East( Kwara central). At Shao in Moro local government area, the Ohoro Shao, Alhaji Bamidele Alabi Adegbite, has declared his support and that of his subjects for the Senate President, Dr. Bukola Saraki, ahead of Saturday’s presidential and National Assembly elections. He assured the Senate President that his subjects would cast their votes for all PDP’s candidates in the Saturday’s elections and the subsequent ones. While asking God to grant Saraki resounding success in the general elections, Oba Adegbite added: You shall retain your position as Senate president. We will support all your candidates. Your enemies shall be brought to shame”. He thanked Saraki for the donation of a giant generating set to the palace and Governor Abdulfatah Ahmed for giving the community a motorized borehole.